? The three-day 2018 amateur draft begins tonight with a live MLB Network broadcast of the first 78 picks. The Yankees have two picks tonight (23rd and 61st). The draft broadcast will begin at 7pm ET. Here’s a mock draft update I put together for CBS and here are the final mock drafts of the year. I’ve heard them linked more to names who probably don’t fit well in the first round, like Grant Lavigne or Adam Hackenberg — guys who’d be perfect targets in the second. Here are my write-ups on Ginn and Lavigne. The whole “linked more to names who probably don’t fit well in the first round” thing sounds scary, though that’s a common strategy in the draft pool era. Cut an underslot deal in the first round, then spend big on a someone who falls with your later pick. The Yankees did exactly that last year with Clarke Schmidt, whose stock was down following Tommy John surgery, and second rounder Matt Sauer. Would not surprise me at all to see the Yankees do something similar this year, albeit with a healthy player. Mayo: Ryan Rolison, LHP, Mississippi — It had mostly been hitters coming up in this spot, and the Yankees could go with Edwards or Lavigne. But Rolison was once thought to be a top 10-15 pick as a college lefty, and after struggling, has pitched much better down the stretch. Callis: Grant Lavigne, 1B, Bedford (N.H.) HS — New York is all over high school position players such as Adams, Lavigne, Seigler and Turang. Here are my write-ups on Lavigne, Jordyn Adams, Xavier Edwards, Anthony Seigler, and Brice Turang. Every time I think about the Yankees and their first round pick, I keep coming back to Turang. He came into the spring as arguably the top high school player in the draft class and a potential top five pick, but his stock has slipped due to an uneven spring. He was once a top draft prospect, he’s a toolsy up-the-middle guy, he’s from Southern California, and he’s the son of a former big leaguer (Brian Turang). He seems right up the Yankees’ alley. We’ll see. We have the Yankees taking the best bat available here, though Naylor does make sense at a number of spots in the teens as well. The Grant Lavigne (Bedford (N.H.) HS) noise around New York is real, but it seems to be an option at a spot later than No. 23 at this point. Prep bats like Turang, Casas and Seigler could also be fits if they last until this point. Here are my write-ups on Naylor, Lavigne, Turang, Seigler, and Triston Casas. Naylor’s grown on me this spring. I kinda ignored him because I’m not a big believer in his older brother — Josh Naylor was the 12th overall pick in 2015 and is a lumbering first-base only masher — but Noah isn’t the same type of player. He’s very athletic with a chance to stay behind the plate, and his hit tool is pretty advanced. Weather permitting, the Yankees and Orioles will continue their impromptu three-game series with the middle game this afternoon. It’s a scheduled 4pm ET start but there is rain in the forecast. We’ll see how it goes. Here are some links and notes to check out in the meantime. Fan voting for the 2018 All-Star Game starters is officially underway. The ballot was released much later than usual this year — voting is online only now, so MLB didn’t have to print paper ballots in advance — which is good. It means guys like Gleyber Torres and Ronald Acuna are included on the ballot. In years past, the ballot would’ve been released before they were called up. Anyway, here’s the ballot. Go vote for the Yankees a few hundred times. At the moment, I see the Yankees having four All-Stars: Aaron Judge, Luis Severino, Aroldis Chapman, and Gary Sanchez. Sanchez’s numbers are a little un-Sanchez-like right now, though a) I expect them to come up these next few weeks, and b) the AL catching crop is a wasteland. There’s Sanchez, Salvador Perez, and … Wilson Ramos? Yeah. Gary’s a shoo-in. The other three guys (Judge, Severino, Chapman) are obvious All-Stars. Torres could definitely force the issue these next few weeks and make it five Yankees at the All-Star Game. Then’s velocity rose last year to 90-94 mph and he showed excellent fastball command for his age. He locates his fastball well to both sides of the plate and mixes in an advanced changeup that’s a potential plus pitch in the future. Then was able to pick apart hitters with his fastball so effectively that there were starts he didn’t use his curveball until later in the game. It’s still an inconsistent pitch that he will need to tighten up to have success against better hitters. The Yankees acquired Then from the Mariners in the Nick Rumbelow trade back in November. He’s already started popping up in organizational top 30 prospects lists — MLB.com ranks him 23rd in the system and Baseball America had him 17th in their 2018 Prospect Handbook — and he’ll join my top 30 list soon. The farm system is on the way down now due to graduations and trades. Guys like Duran, Then, Everson Pereira, and Ronny Rojas are the next wave. 23. SS Brice Turang, Santiago HS, Corona, Calif. This is a similar situation with (Ethan) Hankins, three spots ahead. Turang would have been out of the question this far down the board prior to the season, but scouts weren’t thrilled with how he hit this spring. The Yankees seem to prefer a bat, and Turang profiles better than Triston Casas given his likelihood of sticking at shortstop. Scouting Director Damon Oppenheimer is one of many who’s been getting a late look at Adams as well. Here are my write-ups on Turang and Casas. Adams is North Carolina HS OF Jordyn Adams, who I have not yet profiled. As for Turang, a top Southern California prospect who slips is certainly a good bet for the Yankees. They’ve been there, done that a few times (Gerrit Cole and Blake Rutherford, most notably). More importantly, the Yankees remain connected to position players moreso than pitchers. That’s been a constant these last few weeks. The Yankees have been heavily tied to Virginia lefty Daniel Lynch and Seigler at this pick, along with New Hampshire prep first baseman Grant Lavigne at this pick and their second pick, if he gets there. In the event he doesn’t, there’s buzz that Virginia prep catcher Adam Hackenberg, who has a significant seven-figure asking price, would be a candidate. Longenhagen and McDaniel have the Yankees selecting Lavigne with their second round pick (61st overall). Here are my write-ups on Seigler, Lynch, and Lavigne. I really like Seigler — switch-hitting (and switch-throwing!) catchers with a good all-around game are my jam — and the Yankees are very thin at catcher in the farm system, though you can’t draft for need in the first round. It’s too difficult to project needs two or three or four years down the line. Just take the best player. Anyway, the Yankees are once again connected to bats. You know what that means, right? Get ready for a pitcher Monday. Hjelle, 21 as of a few weeks ago, was born and raised in Minnesota. He was undrafted out of high school, and headed to the University of Kentucky to ply his craft. He has done quite well for himself as a Wildcat, winning the SEC Pitcher of the Year for the 2017 season, and earning preseason All-American status from most every publication heading into this season. He’s currently a junior. Whether or not you clicked the video above, it’s worth repeating the simple fact that Hjelle is a veritable giant, checking in at 6’11”. If he does reach the majors, that would make him the tallest player in the history of the league, alongside Jon Rauch. He’s also something of a beanpole, tipping the scales at between 215 and 225 pounds, depending upon the source. And that represents a fair amount of weight gain from his high school days, when he was a svelte 190. Despite his build, Hjelle is not an overpowering pitcher – at least in terms of velocity. His fastball sits in the low-90s, peaking around 97 MPH; it does have a bit of run to it, though, and his height and release point help it play up despite its modest heat. And, given his height and potential to add good weight, there’s some room for projection. Hjelle’s best pitch is a knee-buckling knuckle-curve in the low-80s, which is a true swing-and-miss offering when he’s on top of it, and his change-up has flashed above-average in spurts. He also throws a slider, but it’s clearly his fourth pitch at this point in time. The primary selling point here is his command. Hjelle has garnered praise for his ability to locate all of his pitches, and that is largely attributed to his clean, repeatable delivery – and that’s not a statement that is often made about pitchers of such great heights. The Yankees have the 23rd and 61st picks, so he could potentially be in-play with both selections. The Yankees aren’t the only team that’s in love with tall, projectable pitchers, though, so I wouldn’t be surprised if he was taken a bit earlier than those rankings would suggest, and I’d be downright shocked if he was available when they came up a second time. Rodriguez is an 18-year-old senior at Central Heights HS in Nacogdoches, Texas. It’s a relatively small school, with an enrollment of just over 300 inclusive of grades nine through twelve, and just two players have been drafted out of the school – Trey Haley in the 2nd round of the 2008 draft, and Dane Phillips in the 49th round of the 2009 draft (and he chose to go to college instead). Checking in at 6’5″ and between 230 and 240 pounds, Rodriguez has the look of a Yankees pitcher. He’s a tall, thick, and imposing figure on the mound, and he has the powerful fastball to back that up, boasting a low-to-mid 90s two-seamer (and flirting with triple digits). Rodriguez’s primary off-speed weapon is a mid-70s curveball with tremendous break, but he also throws a low-80s slider that shows some promise. As is the case with most high school pitchers, his change-up falls somewhere between a work-in-progress and a show-me pitch, and his control is a step or two ahead of his command. It’s worth noting here that Rodriguez re-dedicated himself to the sport over the winter, and reportedly swapped out a good bit of fat for muscle. In addition to showcasing far more athleticism than he had in the past, Rodriguez added a tick or two to his fastball, leading most every scouting outlet to note that he looks and performs like an entirely new pitcher. The Yankees pick 23rd, so there’s a decent chance that he’ll be available when they’re on the clock (though, Jim Callis could see him going as high as 10th). Rodriguez is committed to Texas A&M, which is a strong college program – but, considering his current stock, it seems as though he’s poised to earn a massive payday, so I’m sure that commitment will be tested.
? The three-day 2018 amateur draft is less than a week away now. It begins Monday, when the Yankees will be in Detroit to play a doubleheader. That’ll be a busy day. The Yankees hold the 23rd overall pick this year. Here’s the latest draft dope. They’ve also heavily scouted Grant Lavigne, a prep first baseman in New Hampshire, although he could be there for their second pick at 61. Here’s my write-up on Lavigne. Ginn is my list of prospects to profile before the draft — I always have more names than time — and he’s quite similar to RHP Matt Sauer, the team’s second rounder last year. He’s mid-to-upper-90s with a nasty breaking ball, but his delivery is high-effort, and there’s some thought he’ll wind up in the bullpen long-term. 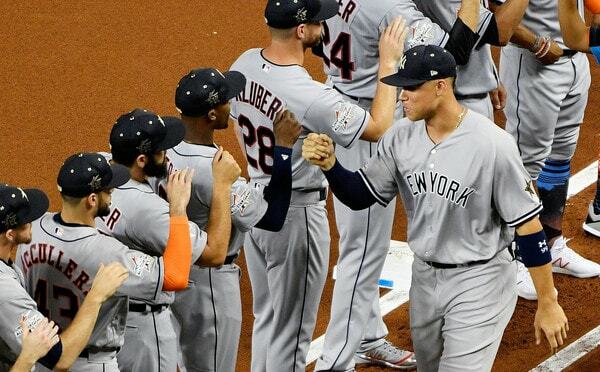 Interesting to see the Yankees connected to arms now. They’d been tied to bats all spring. 3. Yankees: Brice Turang, SS, Santiago HS, Corona, Calif. Bats, particularly high school ones, get mentioned the most here, and if the Yankees wanted a different prep shortstop, they could go with Xavier Edwards from Florida and this could be the high mark for New Hampshire high schooler Grant Lavigne. If they wanted to switch gears, Mississippi lefty Ryan Rolison provides a college pitching option they may not have thought would be available. So we’re back to the “the Yankees are focusing on hitters” thing. Alrighty. Here are my write-ups on Turang, Edwards, and Lavigne. Rolison would be a coup with the 23rd pick. A four-pitch college lefty with arguably the best curveball in the draft class and a summer of dominance in the Cape Cod League? Those dudes usually don’t last long on draft day. Stranger things have happened, but I’d be surprised to see Rolison still on the board when the Yankees pick Monday. Earlier this week Massachusetts HS RHP Mike Vasil announced (on Twitter) he is withdrawing from the 2018 draft and will follow through on his commitment to Virginia. Jonathan Mayo confirms Vasil has been removed from the eligible player pool, meaning teams won’t even be able to draft him and try to change his mind with a big bonus offer. Every year there seems to be that one top prospect who withdraws from the draft and goes to school. This year it’s Vasil. The 18-year-old Vasil was considered a potential top 15 pick earlier this spring, though he left a start holding his elbow a few weeks ago and was later diagnosed with muscle fatigue. Tests showed no structural damage and he returned to the mound earlier this month. Vasil’s a three-pitch guy with a low-90s fastball, a curveball, and a changeup. He has a chance to come out of school as a very high pick in three years, though Virginia has a brutal track record with pitchers. All their guys seem to get hurt or stall out. Lefty specialist Javier Lopez has had far and away the most successful MLB career among Virginia pitchers. MLB announced the club representatives for this year’s draft broadcast earlier this week, and representing the Yankees will be special advisor Nick Swisher and manager of international operations Victor Roldan. The Yankees hired Swisher earlier this year. Roldan has been with the team several years in their international scouting department. Here is the club representatives press release. Over the years the Yankees have sent one familiar face and one behind-the-scenes person to the draft as their representative, which is pretty cool. Good to see guys like Roldan get a little reward for their hard work. The club representatives don’t do a whole lot during the draft broadcast. They’re basically a liaison between the team and MLB when times comes time to make the pick. They’ll also announce picks after the first round at the podium. Who will be more excited, Swisher announcing the second round pick or the kid getting drafted?